The first and only non-invasive treatment to combine radio frequency and ultrasound! Exilis Ultra tightens loose skin, melts away fat and reduces cellulite. Deep tissue all the way up to the superficial layer can be treated by our expert providers by adjusting power and cooling during treatment. Skin temperatures are controlled throughout the entire treatment session for maximum safety. 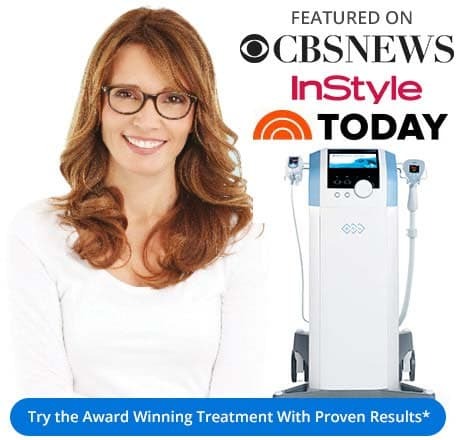 FDA-cleared for non-invasive treatment of wrinkles and reduction of the appearance of cellulite! The best skin tightening and body shaping technology is the Exilis Ultra! It’s only available at New Radiance Cosmetic Centers in Port St. Lucie, Florida! Exilis Ultra™ quickly and evenly heats your skin and dermis with advanced ultrasound and radio frequency energy. This stimulates your body’s collagen and elastin production and rejuvenates treated areas. It tighten skin and also destroys fat cells for complete body sculpting. With Exilis Ultra, you get total body transformation with skin tightening, fat, and cellulite reduction! We normally treat clients starting with one area. After seeing the results of Exilis Ultra, our clients frequently elect to treat additional larger areas – a real testament to Exilis Ultra results. Our clients are very impressed with the results they achieve and you can be too. Exilis Ultra™ is the most advanced, full-body, non-surgical skin tightening, fat busting and tissue lifting procedure available. In our Port St. Lucie Cosmetic Center, you can achieve these results* with virtually no discomfort and absolutely no surgery! This depends on the area treated and results desired. Most patients get 2-4 treatments one week apart. The beauty of Exilis Ultra is your power to treat almost any area of your body. When you visit New Radiance Cosmetic Center St. Lucie, our medical experts will personally help you plan your treatment step by step. To get you started, find the areas you would most like to treat in the treatment areas chart above this text and have them ready when you visit for your FREE CONSULTATION.